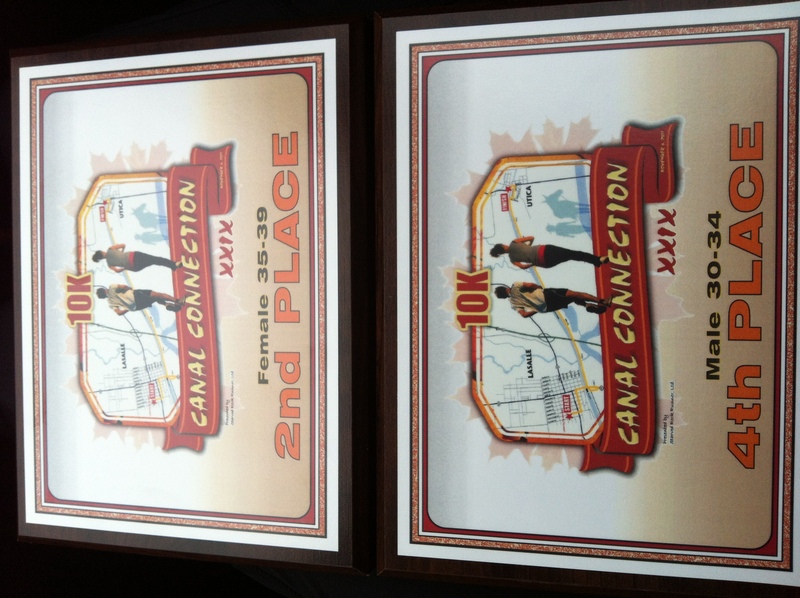 Sunday Rob and I went to Utica, IL to run the Canal Connection 10K. On the way we picked up our friend and my fellow ORRT teammate, Mike. Mike and I are both recovering from soreness, although he can still win races even when not at his best. Mike says he’s willing to hang with me and my tight hamstring. I warn him I may not be a pleasant runner to be near because even my easy runs hurt. I’ve had no speedwork because of trying to recover from my injury so I have no clue if my leg will immediately revolt when trying to 10K. I’m not excited for Mike to potentially witness me at my worst, as I’m sure my attitude will demish with my leg. He says it’s fine and agrees to just stay near and keep any comments/advice to a minimum so I don’t turn into a grouchy pants. To at least try and have fun Mike and I both sported 80s Rayban style adidas sunglasses (it wasn’t sunny out) and white adidas sweatbands on our biceps. Perfect for flexing the guns or shooting hoops afterward, you know. Rob’s ankle has stiffness, but the soreness is almost all gone. He had taken almost the whole week off and was unsure how his race would go since he has also not had any speedwork. It was 25 mph winds from the south and around 50 degrees. 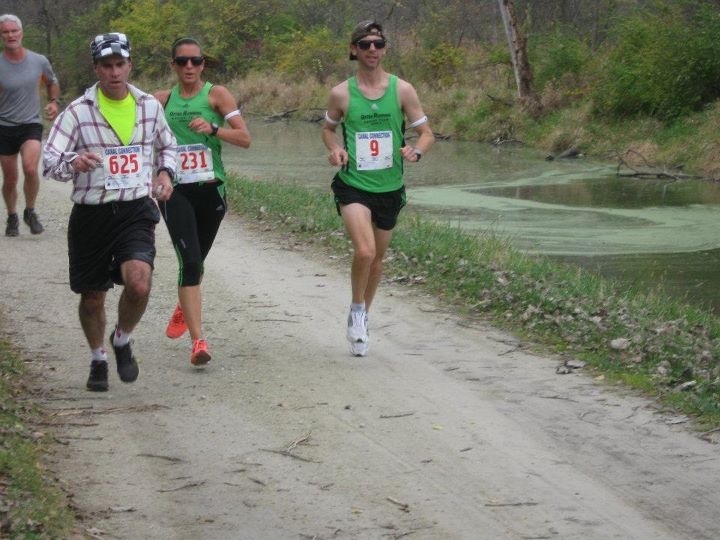 The wind was ridiculous, but most of this race is along a canal that has some sloped land on each side so essentially you are out of the wind. 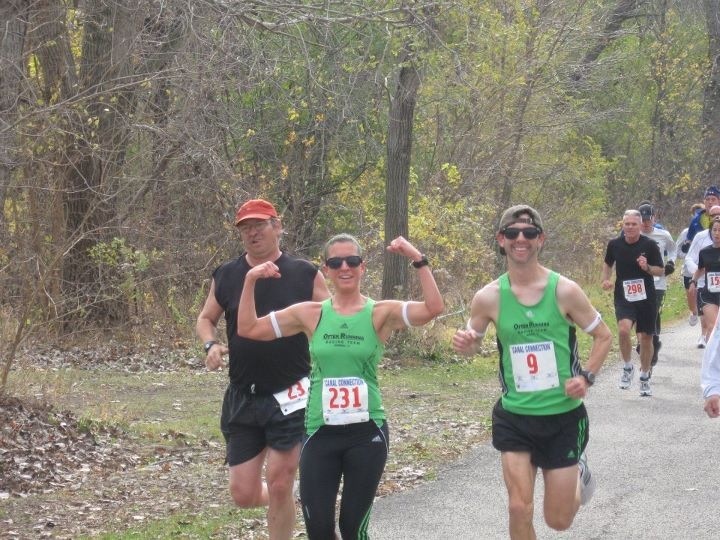 After a clunky 2 mile warm up, stiff hamstring and all, we were off. I was surprised that I’m able to keep the pace I want and hit mile 1 at 6:44. Mile 2 and 3 also go off okay and I’m in the 6:50s, which would set me up for a PR. After mile 3 my leg was getting so stiff and ready to be done. Mile 4 and 5 were so annoying that I stop looking at my watch, there is no point as I’m very aware that my pace is suffering. I only mutter a couple cuss words around this point. It’s so frustrating when my left side is ready to race and my right side just can’t make it happen. Mike gives me the advice to just focus only on the person immediately in front of us. This tip helped me stop thinking about the finish and just on getting to the next person. My leg is screaming tight and I muster through the last mile. Mike makes a gentle comment to the effect of “do you want this” and I’m thinking like “freaking yes I want this, I wish my leg would function”! I come in across the line 1 minute off of my PR with a 44:24 and I am very happy about this. I’m injured, no speedwork and I’m close to my PR. I now feel hopeful that if I can get recovered and focused on my training that I can get back to where I was. Rob also had a good race, only 30 seconds from his PR with similar issues. 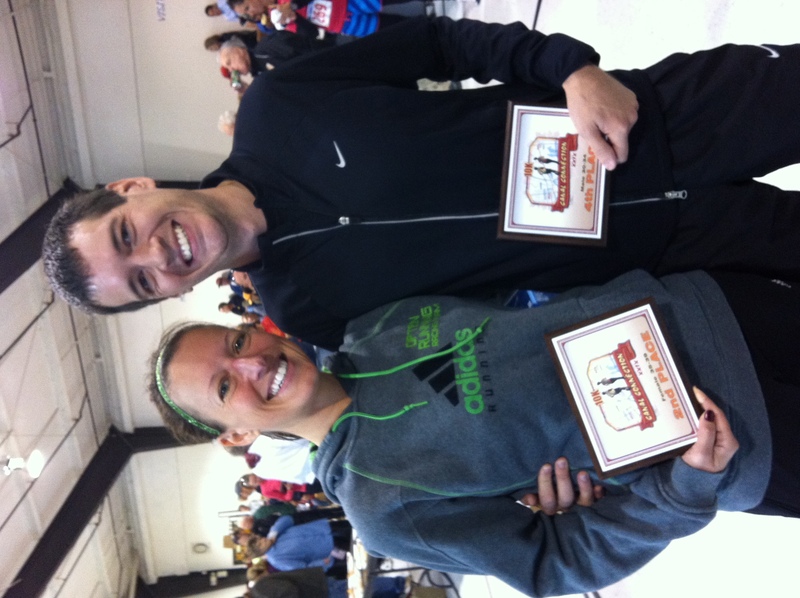 Our race times got me 2nd in my Age Group and Rob 4th in his.